Many Smile Flaws, One Solution – Porcelain Veneers in Park Slope! Living with smile flaws can leave you feeling less confident. Thankfully, with the modern innovations in cosmetic dentistry, you don’t have to settle for staying in this predicament. 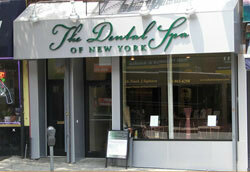 A host of imperfections can be addressed with one procedure – porcelain veneers in Park Slope. Read on to learn what makes this process so effective at creating the look you’ve always wanted! Enamel Removal – The process starts with a thin layer of enamel being removed so the veneers can fit properly. Bite Impressions – Then digital bite impressions are taken that will serve as the basis of the fabrication process. A complete smile plan will be sent to a trusted laboratory that will craft the veneers. Temporary Fitting – While you’re waiting on your permanent veneers to be fabricated, you’ll be fitted with a temporary set of veneers to protect your teeth. Final Fitting – Once your permanent veneers arrive from the laboratory, you’ll be invited back for a final fitting. The temporary veneers will be removed, and the permanent fixtures will be placed using dental cement to bond them to your teeth. Porcelain veneers are unique in that they can mask several cosmetic issues. Thus, whether you have chips, cracks, gaps, misalignment, mild crowding or stains, a set of veneers can work wonders. Not all the benefits are cosmetic either. With straight teeth, you can expect better pronunciation, and you’re more likely to maintain better oral hygiene when you have a smile that you can be proud of. The veneers are stain-resistant. This can be attributed to two features: the quality of ceramic material used and that there are no pores for leftover residue to accumulate in. By having your teeth aligned, you can expect better food digestion. That’s because you’ll have better distribution when you’re chewing. Properly cared for, a set of veneers can last up to 15 years. You won’t have to endure any painful treatment to have veneers placed. The best way to find out if you’re eligible for porcelain veneers is to visit your cosmetic dentist in Park Slopes for a consultation. Once your smile is upgraded, you’ll experience a level of joy and confidence beyond expectation. So the path to a new “You” starts today! Dr. Frank Sapienza is a graduate of New York University College of Dentistry. He has since gone on to provide over 30 years of expert and compassionate care. Still, Dr. Sapienza remains committed to expanding his knowledge. Therefore, he takes continuing education courses throughout the year. He creates beautiful smiles with porcelain veneers at The Dental Spa of New York, and he can be reached for more information through his website. Comments Off on Many Smile Flaws, One Solution – Porcelain Veneers in Park Slope!